Seeing how I still had some ingredients left over, I stayed true to my chopped challenge past and went with a second submission. I had 1/3 of a cup of cashews soaking. And decided to make a spicy cashew radish crema for some tacos. 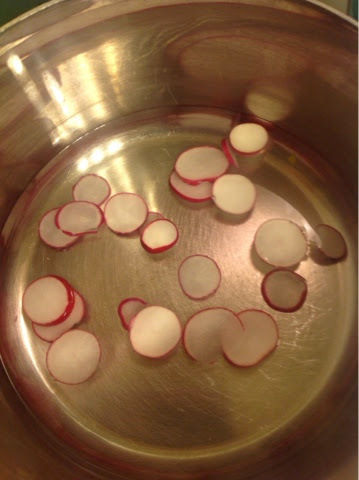 I sliced up 4 average sized radishes, and boiled them for about 10 minutes to soften them up, and bring out their sweetness (I should mention that I am NOT a radish fan, but I am now addicted to the pickled radishes I put in the sushi). After they cooled, I blended them with the cashews, 1/4 of a lemons worth of juice, and about 1/4 of a cup of the oolong tea, and a pinch of sea salt, and put in the fridge to chill. When chilled, I took the remains of the tofu from the sushi, and haphazardly broke it into cubes, threw it in the skillet with a little coconut oil, added some cumin,chili powder, garlic, diced baby Bella mushrooms, and kidney beans and heated it on medium low heat just enough to warm it up. 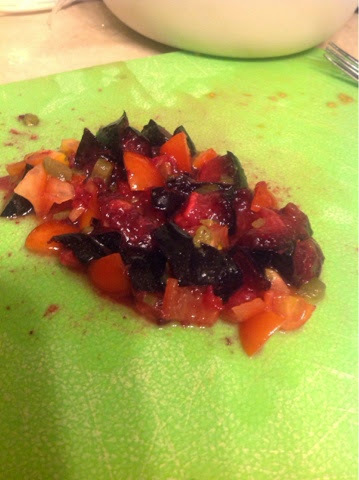 While that was cooking, I made some plum, grape tomato, chocolate balsamic and jalapeño salsa. To top it off, I added about diced 1/4 of an avocado per taco. The. I loaded it up and ate again. I think the capsaicin and turmeric are helping, or at least they did for about 2 hours, because I got a little bit of sleep anyway... Can't wait to see what everyone else made for chopped! that salsa sounds interesting! 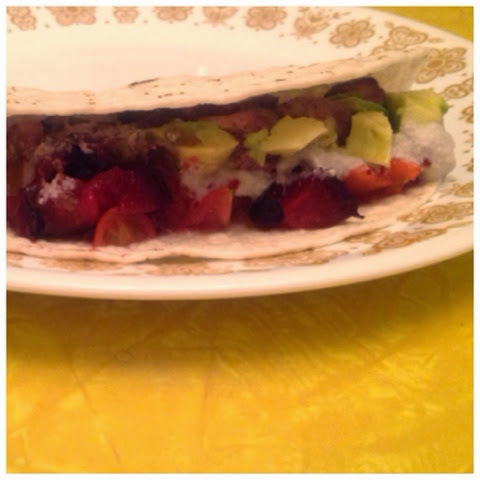 i do not have radishes often, in fact it is only once in awhile on a taco type plate at a place i eat at. I discovered your blog through Vegan MoFo and have really enjoyed reading your posts :) Have a great day!